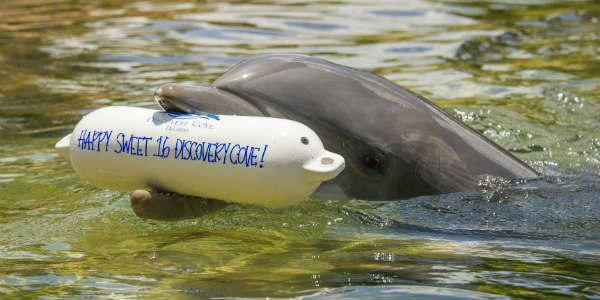 To celebrate its own “Sweet 16” birthday, Discovery Cove has launched a national sweepstakes promotion that will award one winner and 15 of their friends a trip to Orlando to visit the park. The prize includes roundtrip airfare, two nights’ hotel accommodations, transportation and a VIP guest package. A few weeks ago, Aquatica released a sneak peek video for it’s upcoming new water thrill ride. Now the park has released a new teaser video, and announced the name for the new ride. It will be called Ihu’s Breakaway Falls. The drop slide ride is named after Ihu, Aquatica Orlando’s colorful gecko, who searches for the biggest thrills, steepest hills and the coolest spills in the waterpark. The teaser video reveals that in addition to being a drop slide, it will be a multi-slide ride. In the video three people are side-by-side, and then each drops. Are you looking forward to riding Ihu’s Breakaway Falls? If you are a Florida resident, you can take advantage of special rates at Discovery Cove through December 31, 2013. A day at the park includes snorkeling among thousands of tropical fish and rays and encountering playful marmoset monkeys and Asian otters, as well as a tropical bird aviary. A Dolphin Swim Day Resort Package is $219 plus tax. 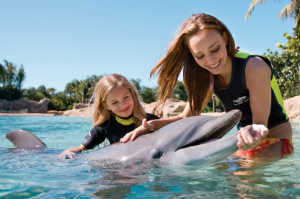 A Day Resort Package, which includes a full day stay without the dolphin swim experience, is $149 plus tax. Both packages include a freshly prepared breakfast and lunch, plus snacks and beverages throughout the day. Guests also receive swim gear (mask, snorkel and swim vest or wetsuit), towels, locker, sunscreen, complimentary self-parking, and a complimentary photo portrait of the guest and their party upon entry. Florida Residents can enhance either package with SeaVenture, an underwater walking tour where guests, wearing dive helmets, find up-close encounters with sharks, one-on-one touches with unique animals and schools of fish and gentle rays. The upgrade is an additional $49 plus tax. 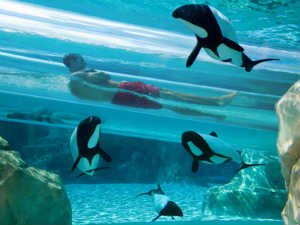 Both packages also include unlimited admission to both SeaWorld Orlando and Aquatica through Jan. 31, 2014, valid after the date of Discovery Cove visit. That right there is an amazing deal. Proof of valid Florida residency is required upon check-in at guest reception. Book online at DiscoveryCove.com or call 1-877-434-7268 for more information. This weekend, Aquatica, SeaWorld’s Waterpark, sent out an email teaser about a new attraction for the park. It was accompanied by an image of a height-test balloon, which is used by theme parks to check sight lines for new attractions. It was tagged 105 feet. According to the email, the new attraction, as yet unnamed, will be “the tallest water thrill ride of its type in Orlando.” No further information on what type of water thrill ride it will be. It sounds like it might be one of those tall drop slides, similar to Summit Plummet at Disney World’s Blizzard Beach. though that one is said to be 120-feet-tall, so if Aquatica’s is the tallest of its type, it will have to be different in some way. Any guesses as to what you think it might be? SeaWorld Orlando’s sister water park, Aquatica, is celebrating its 5th birthday by offering a hugely discounted admission price to Florida residents. On March 1, 2013, if you have a photo ID saying you live in Florida, you can get into the park for only $5. Guests can upgrade to a ticket that includes both Aquatica and all-day access to Banana Beach, for $19.99 (ages 10 and up)/$13.99 (ages 3-9). There are limited quantities of tickets left, and they can be purchased online. There is a limit of six tickets per transaction. It has been announced that SeaWorld Orlando, and its sister waterpark Aquatica, will be raising ticket prices effective immediately. Single-day tickets to SeaWorld will jump to $89 per adult (a 4.7% increase). Their tickets are now the same price level as Walt Disney World and Universal Orlando, both of which raised prices this past summer. Admission to SeaWorld’s water park, Aquatica, will also rise. New price is $55, a 10% increase. And the price of a two-park combo ticket to SeaWorld Orlando and Busch Gardens Tampa Bay will now be $139 (a 3% increase). The biggest price hike, though, will come on annual passes. The price of a basic annual pass will jump $30 to $119.99 (a 25% increase). Some discounts will remain, including the popular “Fun Card” promotion, which allows Florida residents unlimited admission until the end of 2013, for the price of a single-day pass. 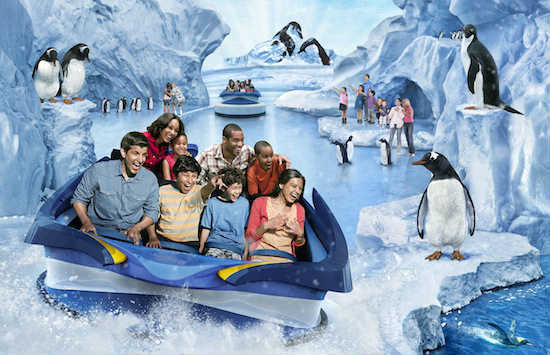 These new prices are in advance of the opening next spring of the new Antartica section of the park, which will be the largest expansion in the SeaWorld Orlando’s history.